Having problems with charting in Crystal Reports? 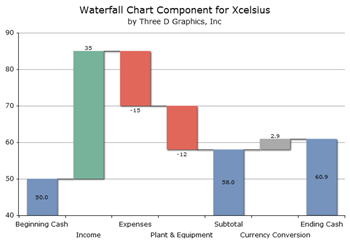 Introducing XC:Waterfall, the most powerful Waterfall chart component for Xcelsius and Flex developers on the market! Three D Graphics is proud to present XC:Waterfall, our latest XCelsius/Flex component. Based on our popular waterfall in WebI:Chart, this new tool vastly expands the type of cascade and floating bar charts available to Xcelsius developers. Add Visual Cash flow analysis to your dashboards with our easy and intuitive programmer's interface. Check out the Live Preview or download our 30-day demo and see it for yourself. XC:Waterfall is licensed on a per-server basis. Each server license entitles you to install the component on one physical server. There are no further license fees (i.e. no per-developer, per-seat or per end-user charges). Your XC:Waterfall license also entitles you to 1 year of first-tier technical support, all upgrades and maintenance builds. We offer techincal support via email, online forum and phone (9am-5pm PST, M-F). Additional yearly support contracts are also available to keep your XC:Waterfall investment evergreen. For more details on XC:Waterfall licensing, please fill out our inquiry form, call us at (310) 231-3330 x307 or e-mail us at info@threedgraphics.com. Despite the power of XC:Waterfall, there might be some graphing requirement which our tool does not completely fulfill. Let the chart experts at Three D Graphics tailor a solution that meets your unique visualization requirements! See other examples of our Xcelsius talents here. For more details on XC:Waterfall customization, please fill out our inquiry form, call us at (310) 231-3330 x307 or e-mail us at info@threedgraphics.com.